Who is the “average” Burning Man attendee? Thanks to Prof. Caroline Lee, a sociologist whose expertise includes the professionalization of participatory practices, I recently gave an invited lecture at Lafayette College in Easton, PA. Among other questions, students asked what kinds of people attend the Burning Man event. In particular, they were curious about participants’ finances. Answering these kinds of questions is only possible because of survey research. * One of the first surveys administered at Burning Man was run by a theme camp called the Ministry of Statistics. Passers-by to the theme camp, which was located in the Central Camp area, were invited to complete the survey, and the Ministry of Statistics posted statistics on the collected data during the event. The media reproduced several of these statistics, including one about drug consumption, in print, much to the dismay of Burning Man organizers who were concerned about the event’s legitimacy. Since then, the Burning Man organization has gathered demographic information via a convenience survey administered during the event. 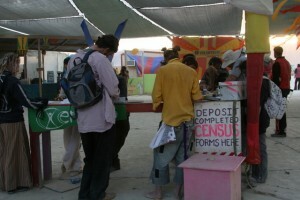 The collected information is available in the AfterBurn report on the Burning Man website. For example, information on salary, home ownership, etc. of surveyed 2007 Burning Man respondents is available here. In other years, the Burning Man organization has also gathered self-reported data on how much participants spent on local businesses; such information was intended to show that the event benefited local Nevada communities. *Also, the idea that one can quantify the “average” person is a relatively recent phenomena. See historian Sarah E. Igo’s The Averaged American: Surveys, Citizens, and the Making of a Mass Public. Next PostNext What to do about dying or failing organizations?